After six seasons of minimal excitement and declining attendance, the Bills have officially killed the great Toronto experiment. Team president Russ Brandon announced the premature termination of the Bills' deal with Canadian telecommunications and media giant Rogers, that saw Buffalo play six regular-season games and two preseason games in Toronto's Rogers Centre since 2008. The agreement had already been suspended for this year, after a fairly disastrous December 2013 edition of the game that saw about as many Falcons fans as Bills fans, and nearly as many empty seats as either. For Rogers, it was an attempt to gauge and drum up interest in a permanent Toronto NFL franchise. (The proof that this was mostly about satisfying Rogers was in the first five-year agreement, which reportedly saw the company pay the Bills a ton of money. The second five-year contract, which began last year, was not nearly so lucrative for the Bills—so they got out of it within a year.) Sure enough, after Ralph Wilson's death, one of the two strongest bids for the Bills was led by the Rogers family. Almost everyone assumed—and every one of the bid group's actions—indicated they would move the team to Toronto if they won. The Bills claim that the experiment was a success from their point of view, as it increased their fanbase's footprint in Southern Ontario. Maybe that's true. But perhaps more important than that, the drumming up of interest in Toronto at least temporarily increased the value of the franchise for when the Wilson family decided to sell it—and Ralph Wilson was already 90 years old when the Toronto series began. Would the Rogers/MLSE/Bon Jovi bid group even have gotten involved if moving to Toronto hadn't been an option? If not, would eventual winner Terry Pegula have had to go as high as $1.4 billion? The Wilsons cashed out, and so did every other NFL owner, who can only salivate over the ballooning prices to buy a franchise. For the NFL, the goal was to open up another potential host city. As with Los Angeles and London, you got the idea that actually moving a team was secondary to the threat of moving a team—allowing owners to extort their local governments for new stadiums and renovations. This wasn't a roaring success—L.A. still remains the bigger bargaining chip—but Pegula is already making noise about a new stadium. In the end, even though Toronto didn't seem to care very much about the Bills (a tough sell unless you're born into that fandom), things seemed to work out well for everyone. The Bills' old owners made some cash, and the new owners received a slightly more valuable franchise. 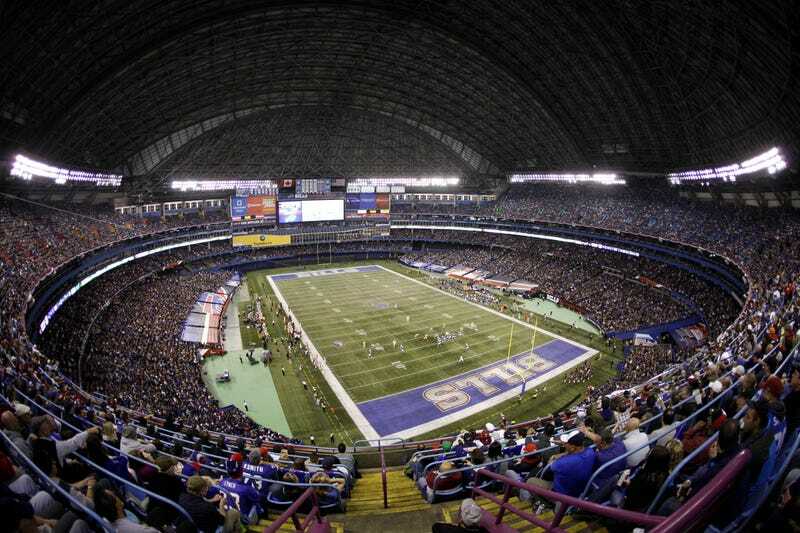 The NFL learned that Canada probably isn't yet ripe for expansion. Rogers still owns almost everything. And Torontonians still have the Argos; once you're used to a historically successful football team, the Bills simply won't do.